About Tattershall Road A traditional old looking ground that has shelter on three sides of it (four if you count the covered turnstile entrance area), the only one in the United Counties League to have such. The land for the stadium was acquired by the Club’s landlords in 1964, and the West and North stands were added in the years that followed. 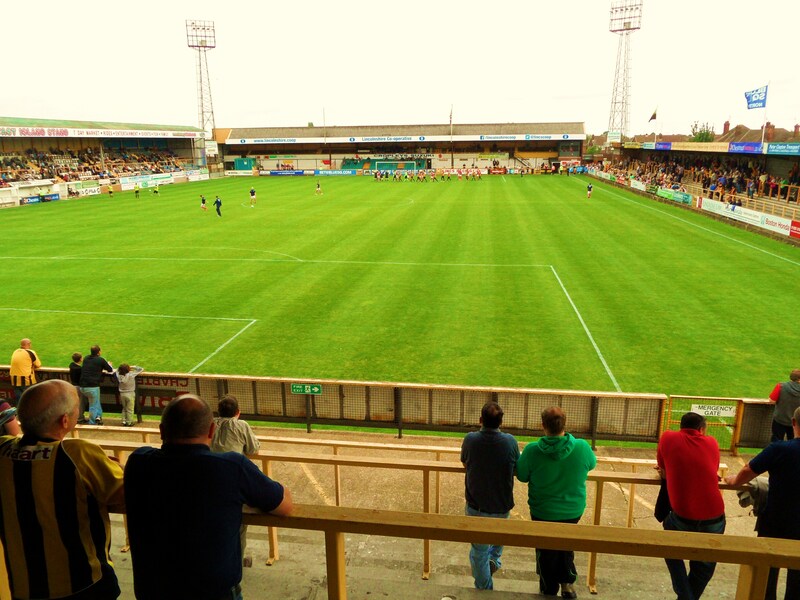 With very little work having been on the stadium in the forty years following, the Club began a refurbishment programme in 2008. The West Stand (affectionately know as the Dog End) saw its wooden staging removed and replaced with brand new seating. In 2010 a new stand was constructed along the previously unsheltered south side of the pitch. Opposite the North Stand is currently undergoing similar work to that of the Dog End, with old staging being removed and replacement seating (acquired from Chesterfield FC’s old Saltergate stadium) going in its place. The East end of the ground comprises the Club House incorporating refreshments kiosk, bar and spectator toilets, and the turnstile entrance to the stadium. As previously mentioned there is some shelter on this side, but to all intents and purposes the Clubhouse End is the only fully open area of the ground. The stadium borders the Witham Way Country Park, being on the northern outskirts of the town, and the stadium is surrounded on the best part of three sides by tall, attractive looking poplar trees, which despite their appeal can also hold hostage the footballs that are kicked out of the ground!How to get to Tattershall RoadThe ground is a bit of a trek if you do not have a car, basically being the last point of habitation before the flatlands of Lincolnshire take over. Approach Boston on the A16 along Spalding Road. Turn left at roundabout onto the A52 and move into the right hand lane. Continue over the railway crossing into Sleaford Road and turn right at the lights. Head past Asda then turn right at the lights, cross over the railway again and the river and take the sharp turn left into Tattershall Road. Continue over the railway crossing, the ground is on the left after three quarters of a mile, Turn left into Witham Way and right into the car park. If you are coming from the west, approach Boston on the A52 Sleaford Road. Move into the left hand lane as you run along side Woodville Park. Turn left at the lights into Brothertoft Road, then at the mini roundabout take second exit right into Argyle Street. Continue over the lights into Fydell Street and go over the railway and the river and take the sharp turn left into Tattershall Road. Continue over the railway crossing, the ground is on the left after three quarters of a mile, Turn left into Witham Way and right into the car park. 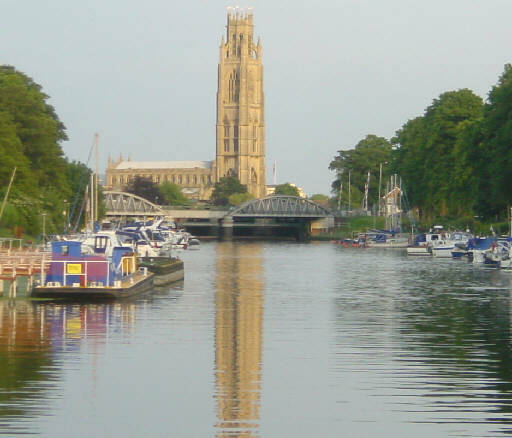 The IntoTown bus service 4 / 5 runs every half hour on match days (Saturdays) leaving from Boston’s Wide Bargate. There is a stop virtually at the entrance to Witham Way, the approach to the Tattershall Road stadium If you are coming by train then I would recommend a cab to the ground.Admission to Tattershall RoadAdmission for Adults is £5, Concessions £3 and Under 16’s are free. Programmes are available inside for £1.Our last visit – September 2012I looked out this morning and the sun was gone Turned on some music to start my day I lost myself in a familiar song I closed my eyes and I slipped awayAs all of you music aficionados know, that is the opening verse from the UK number 22 smash hit from US rockers Boston. The music summed up my start to the day perfectly as I peered out of the window of Northern HQ. Drizzle had taken hold of the day, the same drizzle that had descended on Worksop last night and would hang around until we would pass Peterborough on the way home, when the sun would immediately come out. Today was all about Boston. Not Red Sox wearing, Cheers Bar frequenting, Bullish MIT Boston but Stumpy, Flat, Obese Boston. South-East Lincolnshire’s finest with the highest obesity rate in England rather than the highest IQ rate in the US, Massachusetts. Who needs Michael Jordan when you can have Jason Lee anyway? Lee, one of the nicest men in football, and a good friend of this very website is currently doing a great job as manager of the Pilgrims of Boston United.But today wasn’t just about the Pilgrims. Oh no, we were also going Poaching. Boston is home to not just one, but two football teams and both were at home this afternoon. It would be rude to choose one over the other and so I intended to get a slice of both United and Ton flavours of Boston football. “But how Stuart? I hear you cry “Time travel is impossible and there is only one of you”. I know and without any H.G Wells or Doc Brown time travel apparatus I was going to simply go into Tapas mode – a taster at both just for you, dear readers. First up would be a trip back to York Road to see Boston United play Workington in the Blue Square Bet North. Our last visit had come during their five-year period in the Football League when they demolished Shrewsbury Town 6-0 (and missed a penalty).Some people still have a grudge about The Pilgrims, thanks to a certain Steve Evans, currently at Rotherham United. Evans was in charge of the club when they rose through the leagues and were promoted from the Conference National ten years ago. Except they didn’t do it “cleanly”, with Evans amongst others being found guilty of making illegal payments to players in their promotion season. Unfortunately, our toothless footballing authorities decided to punish the clubs who suffered rather than the guilty parties. Evans was banned from football (although was still able to return to be in charge of Boston after his ban), and the club docked four points but not retrospectively applied to the period where they gained the advantage which meant that Dagenham & Redbridge who finished runners-up to Boston got no redemption. But time moves on. After the Evans era the club became more likeable and their subsequent financial problems were systematic with football in general. However, they are “bouncing back” as Mr Partridge would say. After falling all the way down to the Northern Premier League they came within a game of promotion back to the Blue Square Bet Premier last season under Jason Lee, losing in the semi-final play off to Guiseley. But this season hopes were high for a season of success. In their way today would be Workington, making the short journey of just 229 miles (each way) from Cumbria. Regionalisation at this level really needs some thought as it is ridiculous to think that spending 9 hours in a coach to play one game is sensible. They, like Boston, had played in the Football League although their tenure was a little longer, coming into the league in 1951, replacing New Brighton and leaving after failing to gain re-election in 1977. That vote by the Football League chairman, whilst never proved, was believed to be a protest at the distance most teams faced in getting to Cumbria. Like Corrigan to Shilton, KP to Walkers, MySpace to Facebook and Margaret Michaels to Victoria Principal, Boston Town are the perennial bridesmaids to United’s blushing bride. They exist on the outskirts of the town, comfortable in their surroundings and trying to attract a different type of audience. This part of England is famed for a number of things, but one unique aspect is the number of EU-Immigrants. The agricultural nature of the region means that manual labourers are in constant demand so there is a huge influx of migrants from the rest of Europe. Consequently the club has tried to appeal to local communities of Lithuanians, Latvians, Poles, Portuguese and Romanians even going as far as having different language versions of their website. So after a half of football at United, I would head up the Tattershall Road to take in the second half of the FA Vase (sponsored by Carlsberg don’t forget) where Boston Town would be taking on Loughborough University. The Poachers (they are experts in cooking eggs so I believe) were formed in 1964 by a few ex-Boston United officials who had left after expressing concerns about the financial state of the club (30 years before their time as well!). Their high point came in 1976 when they reached the 1st round of the FA Cup, losing to Barnsley. 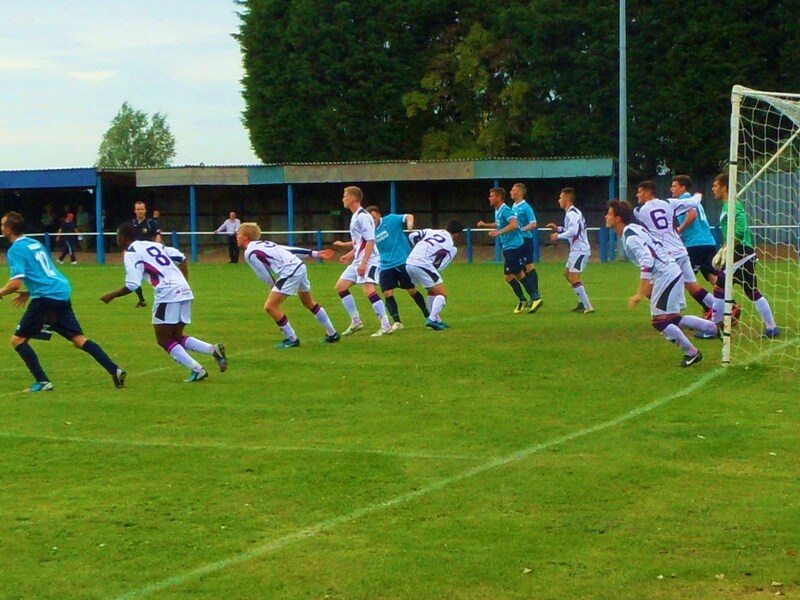 Today they are at home in the United Counties League, with an eye on reaching the Evostik League one day. Alas I would be making my journey on my own. Northern Steve was on party preparation duty for SCMF (Sister of Current Mrs Fuller) who was celebrating her 40th later in the evening. What better present than my return, bearing fables of a far exotic land?Boston United 1 Workington 3 – York Street – Saturday 1st September 2012Just you and me, we were go walking together, Watching the sunrise over the trees Wa-Oo-Wa-Oo-Wa Wa-Oo-Wa-Oo I got to Boston after an hour’s drive South-East from Lincoln, admiring the flat landscape. 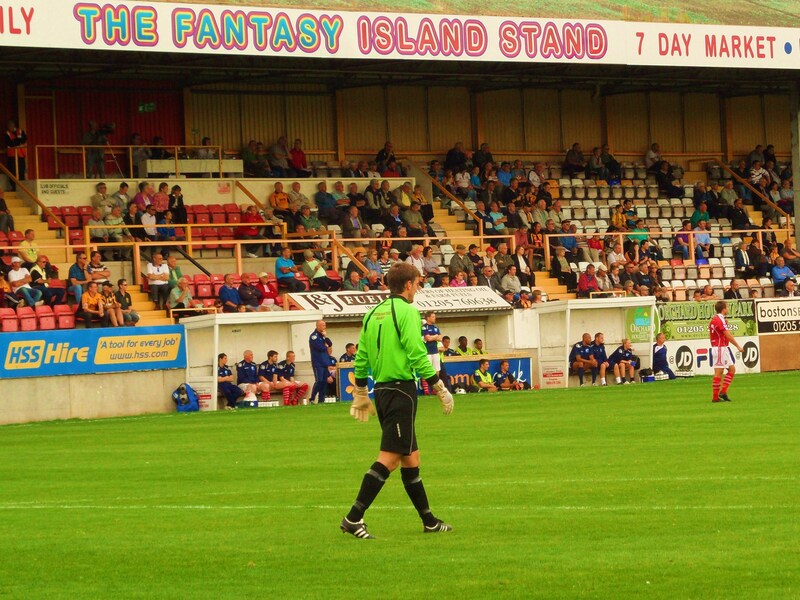 After parking close to York Road I took my place opposite the Fantasy Island stand. I assumed this was in honour of the 80’s trio Tight Fit and their smash follow-up to the number one single The Lion Sleeps Tonight but it wasn’t. It wasn’t even a shrine to the 70’s US TV series of the same name, featuring Tattoo. Oh no, this was part of a sponsorship deal with East Lincolnshire’s Premier amusement park, based in the exotic paradise of Skegness. However, it is neither on an island nor is it in any way part of anyone sane’s fantasies. 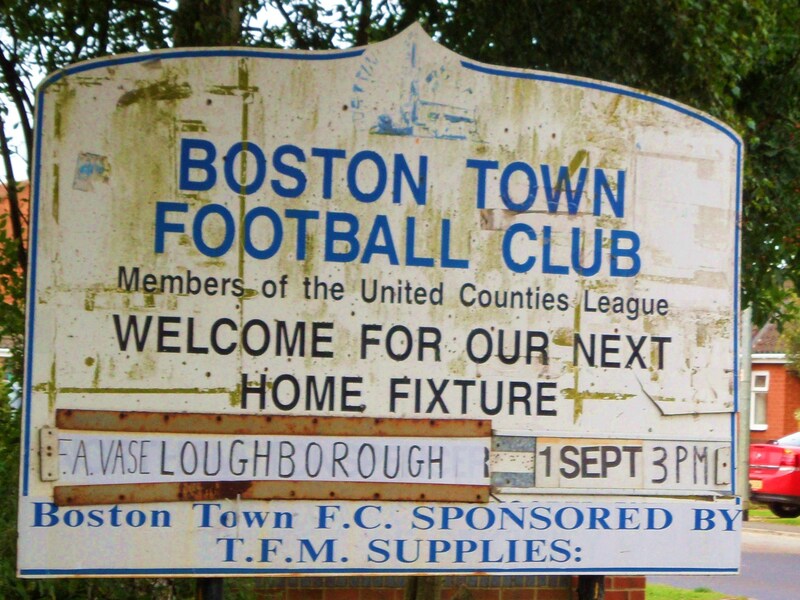 Boston had started the season with two wins out of two, including a 6-0 demolition of Histon. Unfortunately, two consecutive defeat had sent some locals into despondency, judging by the few hundred who turned up for this game (the official attendance suggested just under 1,000 but there seemed less than that). It didn’t get any better for them after 90 minutes against the Cumbrians who came away with all three points. Firstly I have to give top marks to Boston for the finest portion of curry and chips I have ever had. 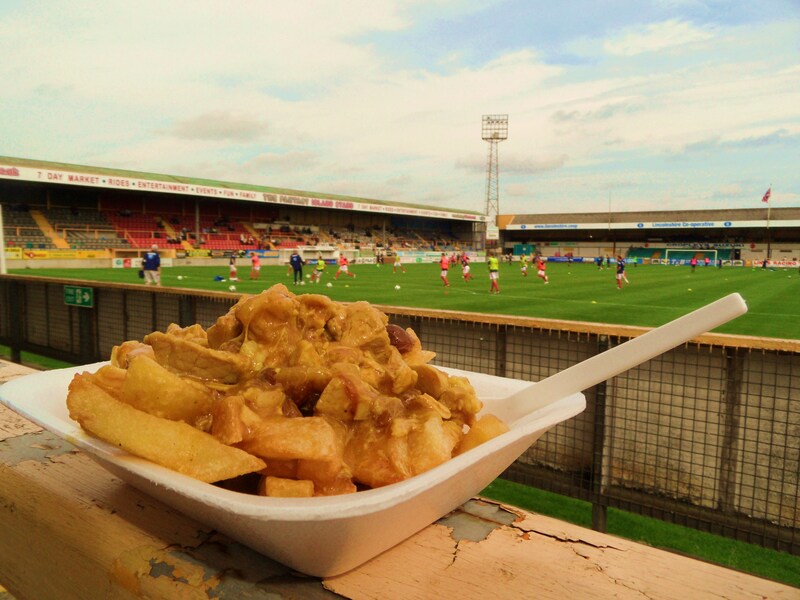 Not a dish you will see on many take away menus down south, let alone in a football ground, it went down a real treat and set me up for a mouthwatering game. The home side certainly started the brighter, but as more often is the case, fell behind against the run of play when Da Costa was adjudged to have been fouled in the area and Gareth Arnison slotted the penalty home. However, the home side continued to pass the ball around nicely, using the width of the pitch, and stretching the visitors. It was amazing it took them until the 38th minute for the equaliser to come. Jones played in Weir-Daley and his shot flashed across the goal and past the Workington keeper. Half time saw my cue to leave for pastures new, but it appears despite dominating play in the second half, Boston didn’t take their chances, whilst Workington did.Boston Town 4 Loughborough University 3 – Tattershall Road – Saturday 1st September 2012 If I was a betting man (yes, yes so you say), I would have lost my shirt, house and probably a few of my organs by lumping heavily on Loughborough Dynamo after an hour of this game. But the reason why we all love football is that literally anything can happen. As we saw earlier today, even West Ham can play entertaining football with “Big Sam” in charge, and even more unbelievably a team completely outplayed and 3-1 down with just twenty-five minutes to go can go onto win a game. But that was exactly what happened in this humdinger of a FA Vase tie at Tattershall Road. I arrived just as the teams returned to the field. Apparently, in true Paul Hardcastle style, the average age of the opposition was 19 (well, they are all students) and they had coasted to a 2-0 half time lead. “Bloody students…when you want them to be hungover from last night they bloody turn up looking like whippets” a local told me when I asked what the score was. It didn’t look good for Town (although ironically, their young female Physio did look good) until they got a slice of luck when the referee gave them a fortuitous penalty which Josh Ford converted to reduce the deficit to 2-1. But the visitors, who were younger, fitter, more organised and tactically more astute, retook the two goal lead when an excellent move across the pitch saw a low cross smashed home by their winger. 3-1 and surely game over? But no, whilst the Loughborough players got out their “Sports Psychology “books and started saying things like “focus”, “0-0” and “shoes” (I made the last one up), they should have listened to David Pleat. The ex-Spurs Manager who loved a slow drive around the backstreets of London (allegedly) always says “You are never more vulnerable than when you have scored a goal” and how true he was today as Boston went up the other end and Matt Barber scored. Pleat for England! (He also said that 3-0 is the most dangerous score in football so he isn’t always right!). Even at 3-2 you would have still fancied the away team but all of a sudden they looked like they had been asked to go to two lectures in a week. Matt Barber surged through the centre-backs and his shot slipped under the keepers body. It got worse. Just 10 seconds were left on the referees watch when Barber played in Josh Ford, the defender slipped and he stroked the ball home to put the home side in the lead for the first time in the tie. 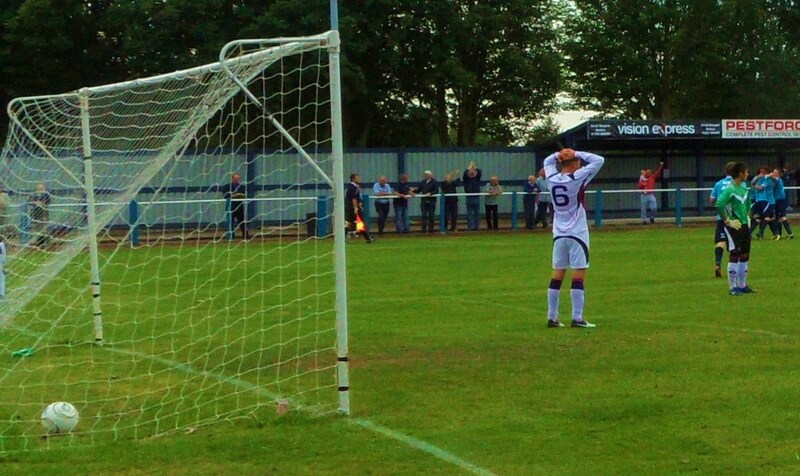 Loughborough were gutted, but paid the penalty for naivety. Boston had stolen victory from the jaws of defeat and as well as pocketing the cheque for £500 for winning the tie, and could look forward to a tasty clash in the next round away to Maine Road whilst the students would have to make do with Pot Noodle’s for a bit longer until their grant cheques came through. Postscript: It is now well over 24 hours after the 1st round ties and still the FA Website is not showing any results or replay fixtures. Their contempt for football at this level is staggering….